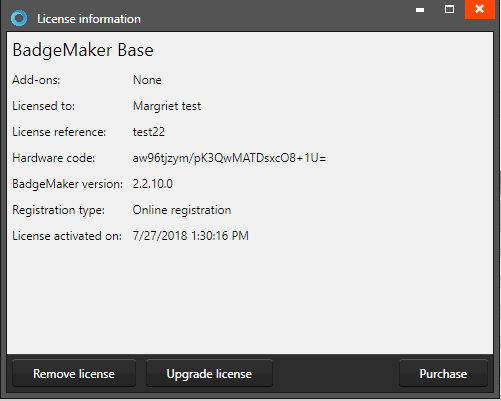 The BadgeMaker Software lets you disconnect your license key from the software installation, so you can use the License key on another installation. So when you buy a new computer you can install the BadgeMaker Software on your new computer, disconnect the License Key from BadgeMaker on the older computer and then use the key to register the new PC. Start BadgeMaker Design or Identity and click on the “Help” button in the main menu. Then select “License information” in the submenu. Press “Ok” to confirm and disconnect Badgemaker key from this installation. Now click on the button to “Remove license”. BadgeMaker prompts a warning, asking if you are sure you want to remove the license key from this system. You can always find the license key disconnected from the software in your License Manager account. 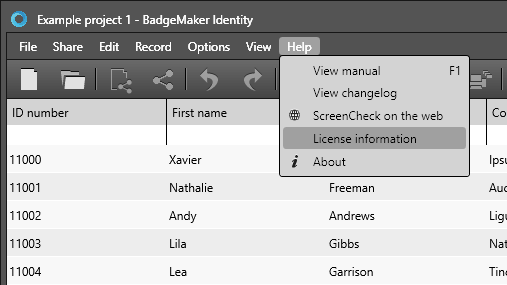 Next to removing the license key, it is possible to purchase an extra key or upgrade a key using a Badgemaker License Manager account.